I found the safest way was to find a nice shady area and put a dense fence around it (something they can't run through). Make the area big enough that you can get in too. If you are there, you will know if it gets too hot or is not safe. I think I’m going to try and make one with c and c grids that are crossed for smaller holes. So the second incident I had with Charlotte involved a paper towel tube. I saw online that you can make a scarecrow out of a paper towel tube, hay, and popsicle sticks and it was piggy friendly! I believe I saw it on Pinterest. I made one for my piggies and gave it to them after their salad that night. I turned the light out and crawled into bed. To make things clear my piggies live in my room. We have a hunting dog so she can’t go into a community space and I spend most of my time in my room reading anyways. So at about 3 at night I heard several loud banging noises. I ignored it at first thinking my dog was jumping on the furniture outside my room. Then I hear squeaking so I jumped up and checked on my piggies. Charlotte managed to wedge half of her body into the roll (with all the places she’s squeezed into I swear her grandfather was a hamster). I had to pick her up and carefully pull her out of the cardboard. With her freaking out and me scared of hitting her it turned into a 30 minutes process. Once she was out she acted perfectly fine and I gave her extra veggies. Since then I always cut the cardboard tubes so they can’t get stuck. Heh. 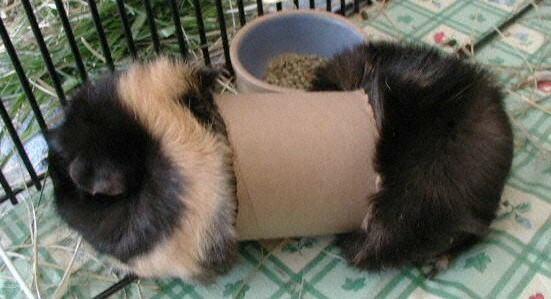 Many years ago I put a somewhat large diameter paper tube in for my guinea pigs. I snapped a shot of Nina, full of shame (shoe buffer, anyone? ), and quickly removed it. That picture always makes me giggle, but it taught me a valuable lesson. I just wanted to put this in because it was a big change in my piggies life, even if it is controversial in the piggy community at the moment. About a month ago, I switched from Oxbow to Sherwood pellets. I was having major problems with calcium deposits and what looked like mild sludge. My piggies also occasionally had runny poos sometimes. I didn’t know what I could be doing wrong if I was following all the guidelines. I saw some guinea pig lovers were switching to Sherwood and I was like hey, why not just try it? It couldn’t hurt anything. I’d just have to monitor them and switch if necessary. So I started the switch a month ago and I’ve has great results. No runny poos, less shedding, and no sludge. There still are calcium deposits, are not as often and they are much finer, almost powdery and they used to be sandy. They’ve had x rats last week and there was no sludge or stones. I’ve also noticed them being more active. Instead of sleeping all the time they run around and play more. That may have no correlation though. I did get them and IKEA bed and they might just be happy to have a new toy. Disclaimer: I’m not saying this works for everybody, from what I understand different pigs have different results with it and if you don’t like that, I respect your opinion just as I hope you have a respect for mine as well. This is just what I noticed with my pigs and I only put it in this thread since it seems to have had a major health impact that will benefit them in the long run. Sadly here in Australia we can only get Oxbow, Peter's(recommended by the RSPCA) and guinea pig and rabbit pellets. We can not even buy overseas as they don't get passed customs. So glad your piggies are benefiting from the change and are enjoying their new toy. Interesting tip. Sherwood pellets are worth a try.